Trendy belt for leather trousers and jeans. The GO-75 traditional belt in black is the ideal accessory for all traditional attire, as well as for a casual leisure look. Thanks to its pleasing brown tones, it is the ideal companion for leather trousers in a variety of different colours and various styles of jeans. 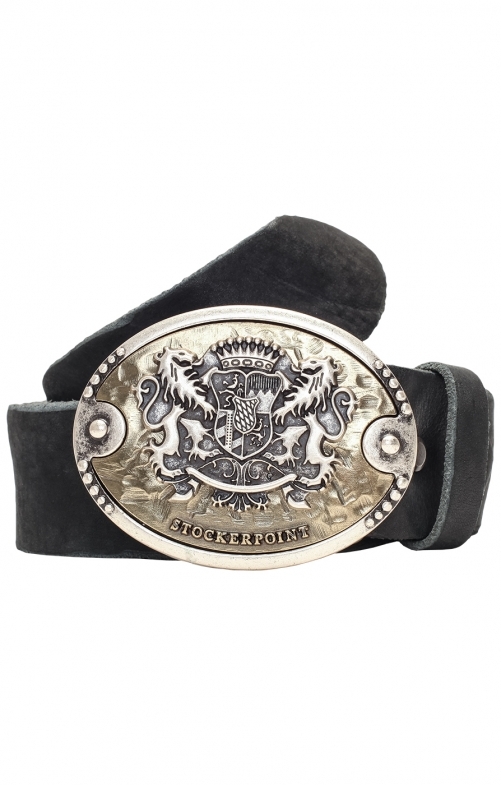 This traditional belt is made of high-quality leather and is provided with an elaborately processed clasp. It consists of an oval base plate and a contrasting insert with a creatively designed motif. It shows two panthers guarding a coat of arms. The belt itself is provided with a row of holes in which the clasp can be hooked as needed. Of course, the GO-75 belt is available in several lengths, ranging from 95 cm to a total length of 120 cm.